With the acquisition of Integrated Photonics in FY17, II-VI extends its broad portfolio of materials with Bismuth Garnet (BIG) and Terbium Gallium Garnet (TGG). 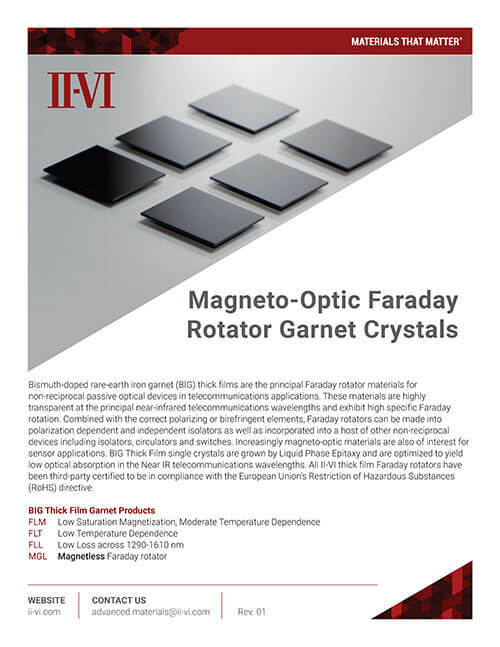 Integrated Photonics is a leader in engineered magneto-optic materials that enable high performance directional components such as optical isolators for the optical communications market. Optical isolators based on magneto-optic materials are embedded in transceivers with edge-emitting lasers and in optical amplifiers. They are widely deployed in datacenters and the global optical network infrastructure at a pace that is accelerated by the rapidly growing bandwidth demand for enterprise and consumer applications, including cloud computing and emerging 5G wireless services.